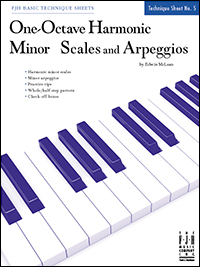 Convenient and easy to use, the Basic Technique Sheets provide an organized way for students to become proficient in necessary technical skills: major and minor pentascales, arpeggios, cadence chords, and one-octave scales. Each Technique Sheet includes valuable practice tips, check-off boxes, and brief explanations on the construction of scales, arpeggios, and cadence chords. Teachers will be pleased with the organized and clear presentation of these sheets, and students will feel a sense of accomplishment as they check off each technique they master!